Rabindranath Tagore (1861-1941) was a Poet, Philosopher, Musician, Writer, Educator, and the first Indian Nobel Laureate for Literature(1913). Tagore has been labelled the “King of Poets” for his beautiful and exquisite poetry. In particular Tagore had a deep love and reverence for nature which he was able to express through lyrical poetry. Although Tagore stayed out of politics he remained a good friend of Gandhi. In fact it was Tagore who would often persuade Gandhi to give up his fasts in the interest of the nation. As a writer, Tagore primarily worked in Bengali, but after his success with Gitanjali, he translated many of his other works into English. He wrote over one thousand poems; eight volumes of short stories; almost two dozen plays and play-lets; eight novels; and many books and essays on philosophy, religion, education and social topics. As well as literature Tagore had a great love of music, in particular Bengali music. He composed more than two thousand songs, both the music and lyrics. Two of them became the national anthems of India and Bangladesh. Tagore was not just a poet but also productive in the fields of art, music and education. 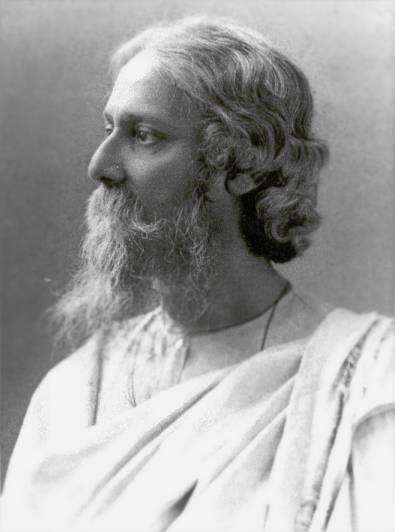 Tagore played a large role in the artistic and cultural renaissance of India which occured in the 20th Century. A project dear to the heart of Tagore was his school Santiniketan. Tagore tried to fuse the best of Western and Eastern values. Fusing the spirituality of the East with the scientific progress of the West.